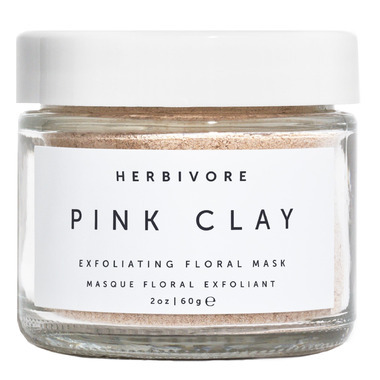 This Herbivore Botanicals Pink Clay Dry Mask is a truly beautifying and skin softening mask. Great to use before a night out or anytime your skin needs some extra nourishing and TLC. There are no fillers in this mask, just skin softening totally natural botanicals and clay. French Pink Clay - Pink Clay is excellent for cell renewal, skin rejuvenation, and improving elasticity. Rosehip - Naturally rich in fatty acids Omega 3, 6, and 9 to regenerate skin cells and repair damaged tissue. Also high in trans-retinoic acid which aids in preventing premature aging. Chamomile - A soothing natural anti inflammatory. Directions: Mix 1/2–1 tbsp. with a few drops of water until a nice paste is formed. Apply to face and let dry. Wash off. Please test this product on a small area before full application. If you have irritation, please discontinue using the mask. High quality powder clay mask. This mask turned me onto dry masks instead of liquid/cream/sheets/peel-off etc. because I can customize what I mix into it; I generally use a little jojoba oil and some water. I recently finished this jar and bought a NOW powder clay mask - I don't know why but this one feels more luxurious (might just be the price tag and packaging lol). I was a little surprised the first time I used this because it turns brown when liquid is added. But I mean, it is clay after all. Now that my jar is empty, I use it to hold small things on my vanity, like cotton swabs or fleece makeup removing pads. I would repurchase as a special treat for myself, or ask for it as a gift. I'd recommend. Sorry didn't like this product. Found it too difficult to remove. Got it %40 off. I feel bad for anyone who paid full price for this. I'm not impressed with this product at all. Feels extremely tight on the skin, scratchy and difficult to get off. It's not pink, it's brown and looks gross. Doesn't have a nice smell either. Didn't notice any difference in my skin. For an exfoliating mask its very hydrating! I usually prefer non powder mask but this one leaves my skin so fresh that I don't mine! ;) Will buy again! It's a tiny pot with no protective lid, so when you open it, it's loose powder everywhere. It's very underwhelming for the price. Performance of the product is good and I like the natural aspect it. Skin feels smooth but not worth the messy prep and the weird smell. Won't be repurchasing. This is the first time I have used Herbivore and so far I am pleased. I like the company's philosophy and the ingredients are natural. This masque definitely works well; I only give it a four star because I do find it is difficult to rise off - you need to blast it off with hot water in the shower, and it is a little fussy (you need to mix it with water) so not great for travelling. I'm not sure I will repurchase this particular product again. Bought this because the brand seems to be gaining some popularity and popping up in sephora. But this mix it yourself dry powder mask didn't do much for me. No instant results like other masks I've tried. Doesn't smell that great. Jar will last for a long time but will not repurchase. Underwhelming for the price. Probably wouldn't purchase it again. Easy to use. But a little hard to wash away. Gentle exfoliate for my sensitive skin. Love it all in all. I bought this to use as an exfoliator and it's done the trick! It got rid of all my dry skin and left my skin feeling soft and smooth.